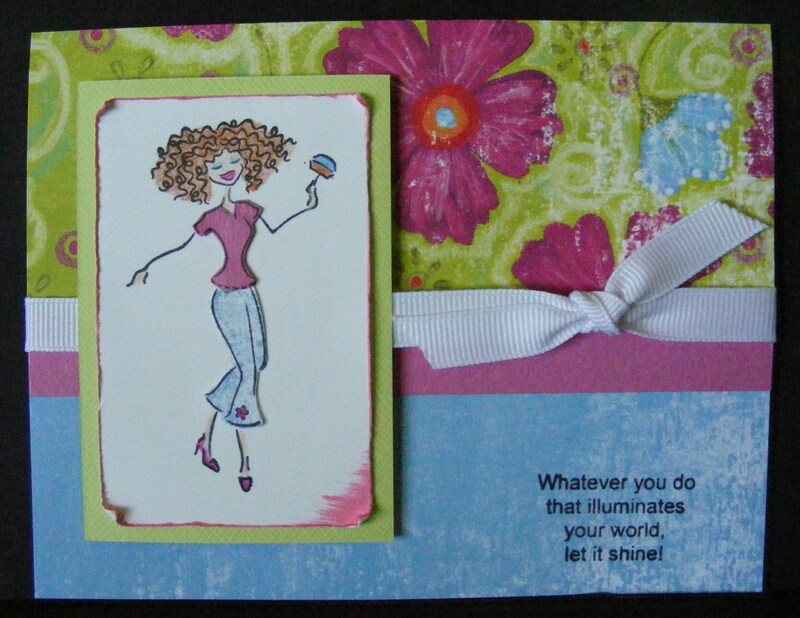 I made this card using the Mia’s Cottage 12×12 Cardstock Collection form The Angel Company. The stamp set was one of many of our demonstrator gifts from TAC’s 2007 Seminar. There are several stamping ladies in this set, but this one looks like me with all the crazy curly hair. I had to dress her in my favorite summer outfit… pink T-shirt and denim capris. I stamped her in black on the white panel and colored in her body with colored pencils. I stamped her again on pink textured cardstock from Mia’s Cottage Cardstock and cut out her shirt. I stamped her once more on the blue patterned paper from Mia’s Cottage 12×12 Cardstock Collection and cut out her capris. I adhered the cut outs to the white panel with Glue Dots. They are so perfect for small areas. I adhered the mounted white panel to the card front with Pop Dots to give the card a little deminsion. I just love this card. This little stamper is so adorable. And you can tell she is so happy because she has a stamp in her hand. All stamping supplies are from The Angel Company. This entry was posted in Cards and tagged Crafts, greeting card, Paper Arts, Paper Crafts, rubber stamping, Stamps, The Angel Company. Bookmark the permalink.